It looks like hand-placed brick or concrete pavers, but it does not crack like brick and concrete pavers. Grass and weeds do not grow like brick and concrete pavers. It does not heave and present tripping hazards like brick and concrete pavers. It is resists salt and other ice control chemicals unlike brick and concrete pavers. Because StreetPrint™ Pavement Texturing is the beautiful, durable and low-cost alternative to brick or concrete pavers. And StreetPrint asphalt texturing is available in hundreds of beautiful texture and color patterns to give your paving project a truly beautiful, custom finish. 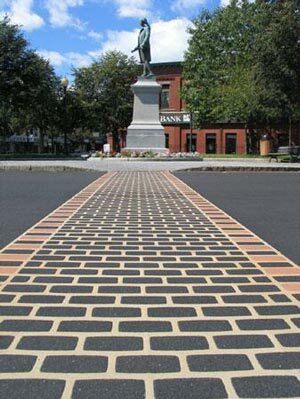 Can you tell the difference between StreetPrint Pavement Texturing™ and individually hand-laid brick or concrete pavers? Not at first glance. But you certainly will over time. Choose from a wide selection of pavers. Click here to see some standard patterns and colors. Contact Arlington Paving to see more! StreetPrint Pavement Texturing™ is optimized for use in pedestrian and moderate traffic applications. StreetPrint™ Pavement Texturing's surfacing systems fortify the asphalt and extend its life. The resulting structural properties and resilience of StreetPrint™ Pavement Texturing applications are consistent with asphalt found on public roadways. All StreetPrint™ products are safe for pedestrians, because of their seamless installation. The continuous asphalt surface means there is little or no chance of it buckling due to weather or shifting due to traffic or mechanical cleaning. Flexible Pavement makes it resistant to cracking and eliminates the need for expansion joints compared with imprinted Portland Cement concrete. Continuous Waterproof Surface resists weed growth and inhibits the migration of water to the base thereby reducing the possibility of base failures due to erosion or freeze-thaw cycles. Easy Maintenance—StreetPrint Pavement Texturing™ is easily repairable and has low maintenance costs. Salt Resistance—StreetPrint Pavement Texturing™ does not react to salt used for deicing or from salt air in coastal climates. Quick Installation (as much as 10 times faster than cement bricks) resulting in much less disruption to traffic. Elaborate Decorative Patterns—StreetPrint makes it practical to create embossed artwork in the surface. This can be done quickly and easily and creates a whole new opportunity for decorative pavement designers. Here is the solution to one of the Public Works Director's nagging complex problems. That of installing and maintaining safe, visible, durable, repairable, cost-effective crosswalks. StreetPrint DuraTherm™ is the solution for the market's demand for a decorative product suitable for high traffic applications. Snow Plow Friendly: no seams; no plow trip points! Built Tough for High-Traffic Crosswalks, TrafficPatternsXD™ is an extremely durable preformed thermoplastic material that incorporates a unique aggregate-reinforced formula with unprecedented wear resistance. Channel pedestrians across busy commercial parking areas. 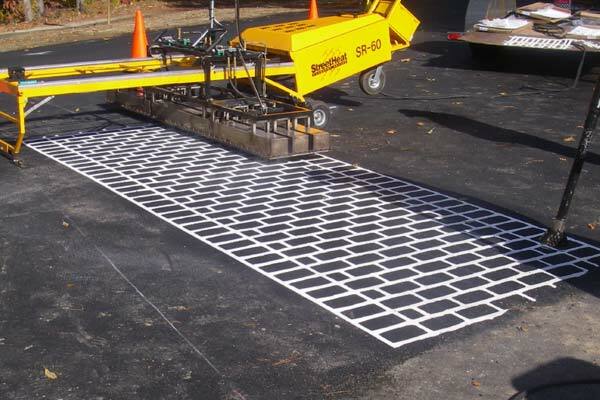 TrafficPatternsXD™, offers fast and efficient installation, skid and slip resistance, and minimal maintenance compared to stamped concrete and pavers, which can result in maintenance headaches, pedestrian hazards, slow installation, and lengthy traffic disruptions. Fast Application for minimal traffic disruption. High Skid/Slip Resistance: As the material wears, new anti-skid elements are exposed. Enhanced Durability: Designed for high-traffic crosswalks and traffic calming surfaces, this product stands up to extreme use and wear. Accessibility: although stamped to deliver the look of brick, there is no bumpy surface, resulting in a pedestrian and mobility friendly surface. Maintenance: Eliminates loose pavers and repairs can be made with minimal traffic disruption. If your organization wants to make a welcoming statement and project a positive image to everyone who enters your building, then consider StreetPrint LogoTherm™. High technology manufacturing assures accurate logo reproduction. Our qualified graphic artists develop high quality digital versions of your image for each design. This digital information drives our high definition laser cutting process. The result is high precision, detailed images that accurately represent your logo.